A Japanese probe has about a 1% risk of crashing into Mars, officials say. Engineers are racing against the clock to fix the Nozomi space craft so it can go into orbit around the Red Planet. But the probe, which is Japan's first interplanetary mission, has had serious onboard electrical problems since it was hit by a solar flare in 2002. If mission controllers cannot fix the glitches, they must try to turn Nozomi away from Mars so it does not collide with the planet and contaminate it. 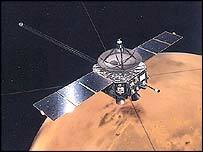 Nozomi, which means "hope" in Japanese, was launched in July 1998 and should have arrived at Mars the following autumn. But problems started soon after take-off. A technical fault left Nozomi low on fuel and its flight path had to be radically altered to get it to the Red Planet. Two fly-bys around the Earth put it back on track, but the craft was exposed to a solar flare that damaged its electrical systems. Engineers now have only a week left to resolve the problem before time runs out for the ill-fated voyage. If it cannot be fixed, Nozomi will not be able to go into orbit around Mars to carry out its science mission. Instead, it will probably shoot past the planet at an altitude of at least 894 kilometres. 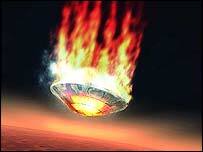 There is a small risk, however, that the space craft will collide with Mars. This would be a disaster, because any Earth-borne microbes would contaminate a pristine environment that may once have harboured life. Japan's Institute of Space and Astronautical Science acknowledged in a statement on its website that the theoretical possibility of a collision was "more or less 1%". Scientists and engineers were concentrating on "the last challenge" of repairing the malfunction, it said. "Upon recovering from the damage, we will then work on putting the probe into orbit around Mars and resume its exploration," the statement added. "Unfortunately, if not restored, we will try to adjust the closest approach as far as possible from 894 km. "In this case, Nozomi will, after once approaching Mars, escape from (the) Martian gravitational sphere to become an artificial planet going around the orbit of the Sun forever." Space craft are bound by international planetary protection standards set by the Paris-based Committee on Space Research (Cospar). The most stringent guidelines are for landers which actually touchdown on the surface of another planet. Orbiters must also adhere to strict standards. Trajectories must be fine-tuned to ensure there is never more than a 1% chance of an orbiter crashing into a planet. John Rummel, chair of Cospar's Planetary Protection Panel, and Planetary Protection Officer at the US space agency (Nasa), believes Japan is doing all it can to operate the space craft to avoid contaminating Mars with bacteria from Earth. "The Japanese have made heroic efforts to provide a space craft that contributes to the study of Mars," he told BBC News Online. "But in the face of confounding everybody's science in the future (they) have acknowledged that they will avoid doing that." If Nozomi ends up sailing past Mars there will be a glimmer of consolation for the thousands who signed up to have their names etched on an aluminium plate on the space craft. "The names of 270,000 people will keep on circling around the Sun for hundreds of million years," said the Institute of Space and Astronautical Science. Nozomi is currently at the front of a queue of space craft heading to Mars. By 14 December, it will either be in orbit around Mars or will have overshot the planet. This will clear the stage for the European Space Agency's Mars Express orbiter, which is set for a festive rendezvous with the fourth planet from the Sun. On Christmas day, it will go into orbit around Mars, having jettisoned its cargo, the Beagle 2 lander. The first of Nasa's two Mars Exploration Rovers, Spirit, is set to land on the Martian surface on 4 January. Opportunity will arrive towards the end of January.